With a prime spot on busy U.S. Route 202, the business has chosen to share catchy quotations instead of sell products — and customers love it. MANCHESTER — When Larry and Chrystal Violette started their business 25 years ago, they decided to do something different with their outdoor advertising. Instead of promoting Copies Etc and its products on a sign along busy U.S. Route 202, just west of the Route 17 intersection, they decided to put clever but uplifting messages on their big sign. 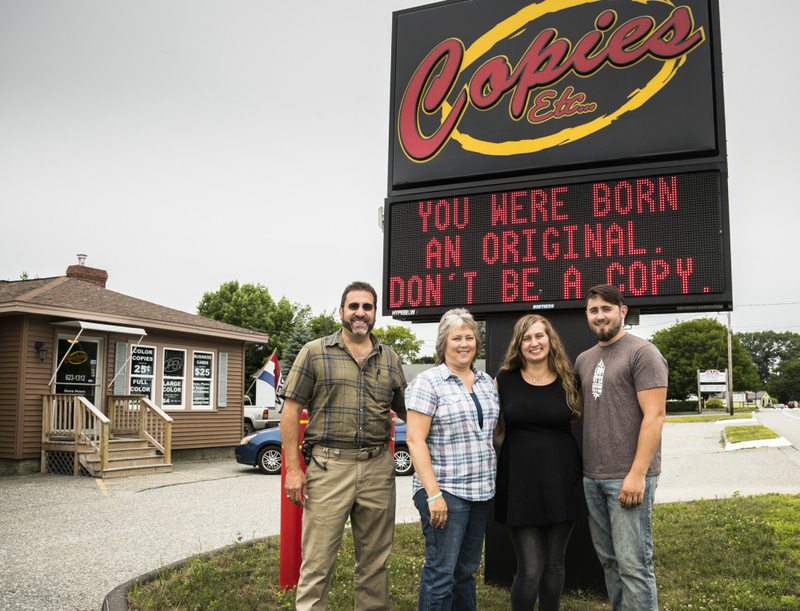 Now celebrating the 25th anniversary of Copies Etc, which offers a wide variety of copying services, the Violette family has posted thousands of messages on their sign and has caught the attention of a multitude of motorists. “We started putting up quotes that people just loved,” Larry Violette said. And the maxims often have a punch line that’s sure to make passing motorists smile. The messages are short enough to be read by drivers moving past the sign at 45 mph. The sign is likely to draw a smile and make the motorist think, at least for a moment. Larry and Chrystal’s two children, Stephen Violette and Ashley Flewelling, joined the business when they were old enough. Ashley’s 2-month-old daughter, Ruth, often joins her mother at work; and the Chihuahua, Joey, also has free run of the office. There are nine grandchildren in all. Steve and Ashley were both home-schooled, said Larry Violette, who is 53. Copies Etc grew over the years and took on more space as business expanded. At first, the Violettes had to climb up a ladder and change their sign message, letter by letter, once a day in all kinds of weather. But almost three years ago, they bought a big electronic sign with red letters that can be controlled from inside the shop. Now the sign’s message, which is the same on both sides, changes every five minutes. If a driver passes by in one direction and then returns, it’s likely he or she will see a different message on the return trip and get the impression that the sign has different messages on each side. With the electronic sign, it’s also possible to stock up on messages ahead of time. “We have more than 1,000 different quotes in there now,” Larry Violette said. After they pick a quotation, the message must be trimmed and tailored so it fits on the sign, which has room for only a limited number of characters. The Violettes have begun posting messages on their Facebook page and changing them every day. They have found posting messages on their outdoor sign to be a rewarding way of communicating with the public. 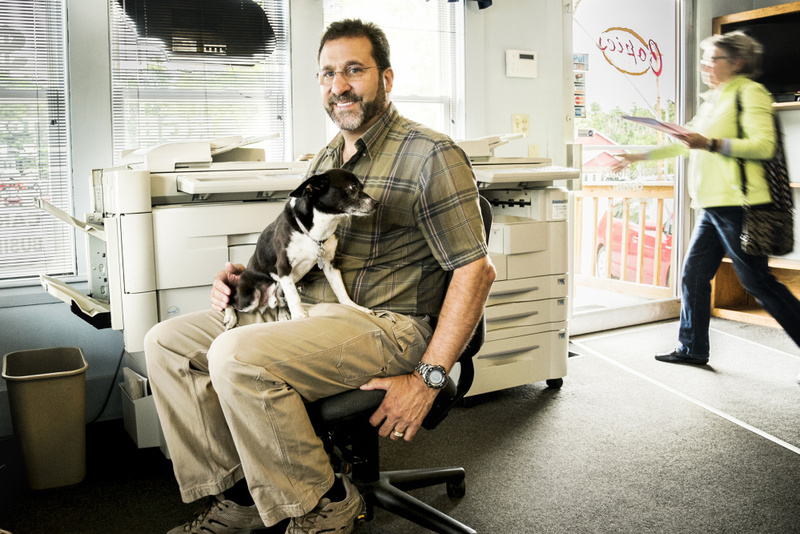 “People appreciate the small-business, family aspect of it,” Larry Violette said.